Boubacar Boris Diop at the Salon du Livre 2011 in Geneva, Switzerland. Photo by Rama, Wikimedia Commons, CC-by-sa-2.0-fr. Dickinson has named prolific, award-winning novelist and journalist Boubacar Boris Diop the 2018-19 recipient of the Harold and Ethel L. Stellfox Visiting Scholars and Writers Program Award. During his upcoming residency at Dickinson, Diop will visit classes and meet with students. He will also present a reading followed by a book signing and reception, on Thursday, April 11, at 7 p.m. in the Anita Tuvin Schlechter (ATS) Auditorium. 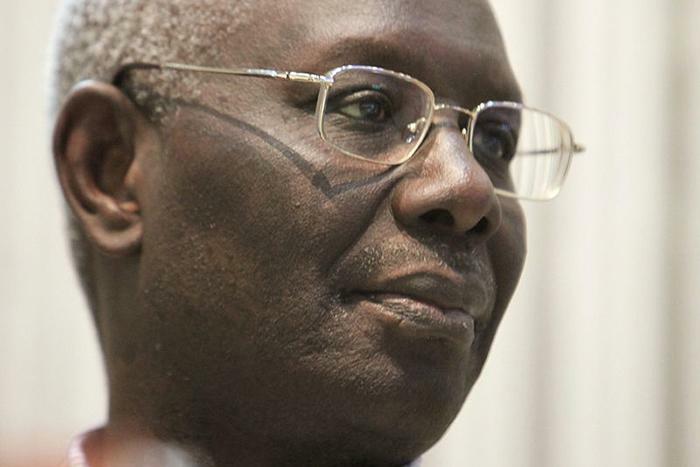 Born in Dakar, Senegal, Diop is widely recognized as one of the most artistically and philosophically serious writers of his generation, with works that are characterized by exploration and reflection on the postcolonial condition in Africa. His 2000 novel Murambi: The Book of Bones has been called “a miracle” by legendary American author Toni Morrison and was featured on the Zimbabwe International Book Fair’s list of the 100 best African books of the 20th century. The novel is a fictional account of a massacre during the Rwandan genocide of 1994. Diop currently is professor of literature and creative writing at the American University of Nigeria. Previously, he has taught at Rutgers University and at Gaston Berger University in Senegal. He has also worked as a reporter for several newspapers in Africa and Europe, and he is the author of dozens of books, plays and screenplays. Diop’s latest published novel, written in the Wolof language, is Bàmmeelu Kocc Barma (A Grave for Kocc Barma). The Stellfox Visiting Scholars and Writers Program is supported by a gift from Jean Louise Stellfox, a 1960 graduate of Dickinson who was inspired to become an English teacher after meeting Robert Frost during the poet’s visit to the college in 1959. When Stellfox died tragically in 2003, her estate provided $1.5 million to the college to continue her mission of inspiring students by bringing renowned literary figures to campus. Stellfox named the program in honor of her parents, Harold and Ethel L. Stellfox. Diop is the 14th esteemed writer to serve in a Stellfox residency at Dickinson. Previous honorees include Pulitzer Prize-winning playwrights Edward Albee and John Patrick Shanley; Nobel laureate Mario Vargas Llosa; Pulitzer Prize-winning poets Rita Dove and Paul Muldoon; Guggenheim Fellow Naomi Shihab Nye; National Book Award-winner and MacArthur Fellow Edwidge Danticat; Tony Award-winning playwright David Henry Hwang; and Booker Prize-winning authors Ian McEwan and Margaret Atwood.